Like a phoenix rising from the ashes of devastating injures this season, Galatasaray Liv Hospital moved into a tie for Group F's last playoffs spot when it held of FC Bayern Munich for a 76-69 victory before 10,000 adoring fans in Istanbul on Friday. The victory forged a three-way tie for fourth place with Munich and Lokomotiv Kuban Krasnodar, all with 5-6 records and three games left in the Top 16. Among the three, however, Galatasaray enjoys a tie-break advantage due to its two victories over Munich and one over Lokomotiv. Carlos Arroyo masterminded Friday's win by scoring 16 points and dishing 11 assists, a Galatasaray club record in the Euroleague. 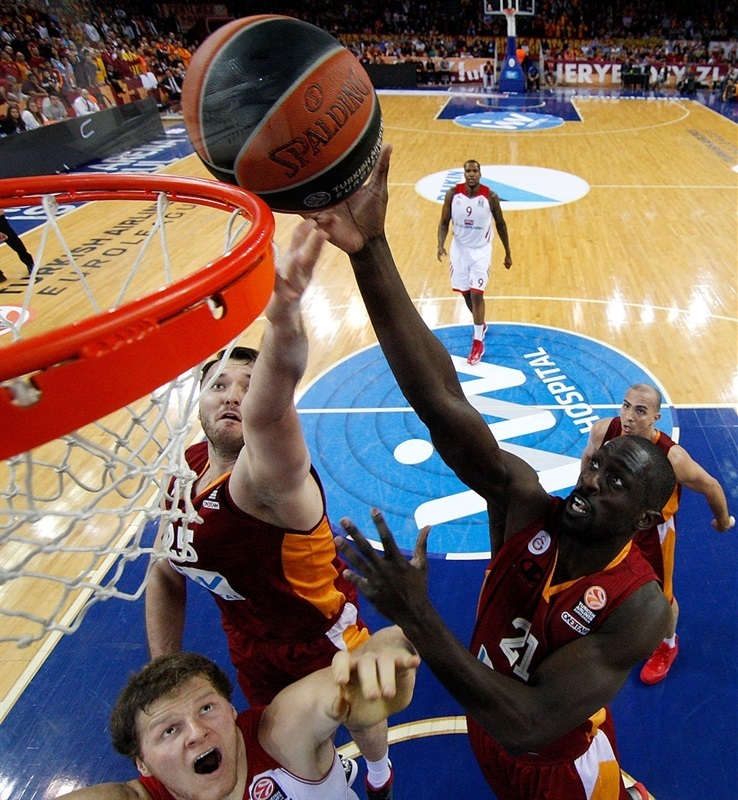 His 2 baskets and alley-oop lob to Pops Mensah-Bonsu seized a 30-25 second-quarter lead that Galatasaray did not relinquish, although Munich stayed close for much of the game. Mensah-Bonsu and Malik Hairston followed with 14 points each for the winners, who made 23 of 37 two-point shots, or 62%. Munich got 16 points from last week's MVP, guard Malcolm Delany, 12 and 7 rebounds from John Bryant, 10 and 6, respectively, from Yassin Idbihi. After rallying from 12 points behind, Munich was as close as 71-66 entering the game’s final minute, but Arroyo's last alley-oop to Mensah-Bonsu put the lid on a result that could change fortunes in Group F.
Delaney opened the scoring with a transition jumper off a steal that Manuchar Markoishvili matched with a tough turnaround shot. Zoran Erceg got a rise from the crowd with a four-point triple-plus-free throw combo for a quick 6-2 lead. No sooner did that fall, however, than Heiko Schaffartzik nailed Munich's first three-pointer. He didn't wait long to make the second, too, putting Munich in front, 7-8. When Delaney stole and dunked, then Bryant banked in a jumper, it was suddenly 7-12 for the guests. Hairston's fastbreak layup ended Munich's 1-10 run. Ender Arslan came on after a timeout and fed Furkan Aldemir for a layup, but Boris Savovic got those 2 points back for Munich. Arslan then let go his first shot, a three-point bullet to forge a 14-14 tie before Bryce Taylor's jumper took back the lead for the visitors. Erceg and Arroyo combined on 3 of 4 free throws for a new Galatasaray lead, 17-16, but Idbihi made 1 of his 2 for a new tie. 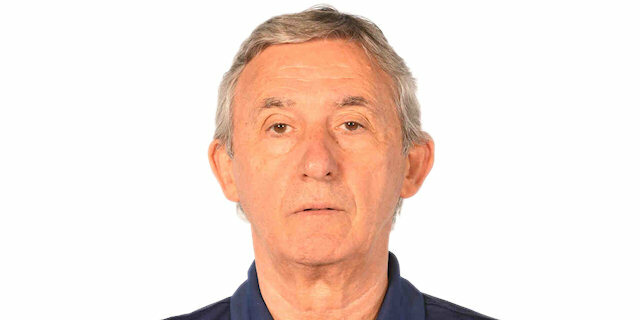 Nihad Djedovic buried a go-ahead triple for the visitors, but a foul and a technical on Munich head coach Svetislav Pesic got Galatasaray within 19-20 before Arroyo fed Hairston for a reverse dunk, yet another lead change to close the first quarter 21-20. 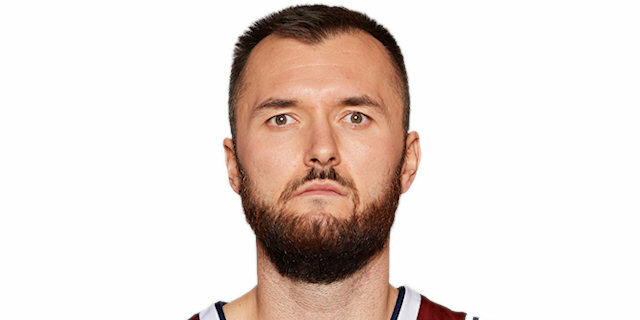 Idbihi's offensive rebound and put-back had Munich ahead for a moment again to start the second quarter before Milan Macvan introduced himself for Galatasaray with a big triple. Delaney answered with his own long-range strike as the scoreboard changed again, 24-25 in Munich's favor. Soon it was Arroyo, in transition, flipping the score. He then banked in a jumper and raised the roof with a lob pass that Mensah-Bonsu flew high to dunk. Deon Thompson for Munich and Sinan Guler for the hosts exchanged baskets at 32-27. Djedovic was perfect at the foul line, but Arroyo matched him with a baseline jumper to which Macvan added a fadeaway as Galatasaray took its biggest lead yet, 36-29. Out of a timeout, Arroyo scooped in a layup before Bryant ended Munich's drought with a jumper. Arroyo put back his own miss and Galatasaray's defense kept strong until Henry Domercant hit his own bank shot, worth the game's first double-digit lead, 42-31. 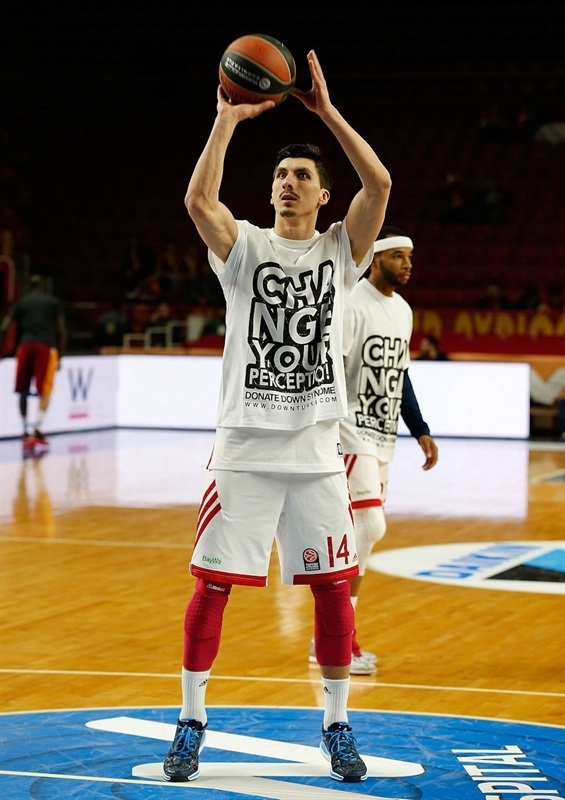 Schaffartzik saved Munich with his third three-pointer to end the half on an up-note despite Galatasaray still in charge, 42-34. Mensah-Bonsu's steal led to 2 free throws by Guler and a new 10-point lead, 44-34. Delaney's reverse got Munich's second half going, then he fed Bryant for a dunk to cut the difference to 44-38. Arroyo and Mensah-Bonsu then ran a pair of pick-and-rolls, the first ending with the latter's reverse dunk, the second with a free throw to make it 47-38. Munich couldn't hit on a three-chance possession before Galatasary moved the ball to Markoishvili for a corner triple. Taylor answered with a spectacular reverse that Mensah-Bonsu matched with an easy dunk and a new high lead of 52-40 for the hosts. Idbihi came on to revive Munich's offense with a jumper, but Mensah-Bonsu equalled it with free throws. Thompson's jumper for Munich was met by Arroyo's great pass ahead to Hairston for a new 12-point lead, 56-44. And when Lucca Staiger pumped a triple for Munich, Arroyo lobbed his ninth assist to Hairston for a dunk at 58-47. Idbihi led a Munich charge in the final 2 minutes, following a short shot inside with a jumper-plus-free throw combo, lowering the difference to 58-51. A pair of free throws by Thompson around Hairston's driving left a 60-54 scoreboard after 30 minutes. Arroyo buried a jumper in transition and Aldemir registered a block to start the fourth quarter with Galatasaray ahead 62-54. 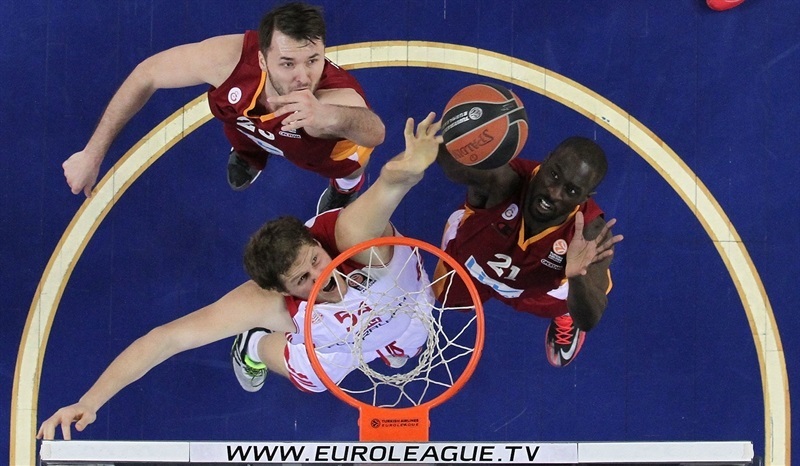 Galatasaray's defense held Munich scoreless for more than 3 minutes until Bryant was left open for a jumper. When he turned a dropped a jump hook, Munich was ask close as it had been since midway through the second quarter, 62-58. Mensah-Bonsu returned and changed the momentum with a key basket-plus-free throw at 65-58. Bryant got loose for a dunk that Arslan matched with free throws as Galatasaray held a 67-60 advantage with less than 5 minutes remaining. Staiger got to the free throw line to lower the difference by 2 points. Macvan got it back with a hook shot after an offensive rebound. Delaney scored off an inbounds play to keep Munich close before a turnover led to Arroyo racing alone for a layup and a 71-64 lead. After a timeout, Delaney earned a quick 2 free throws, making it 71-66 with 2:20 to play. 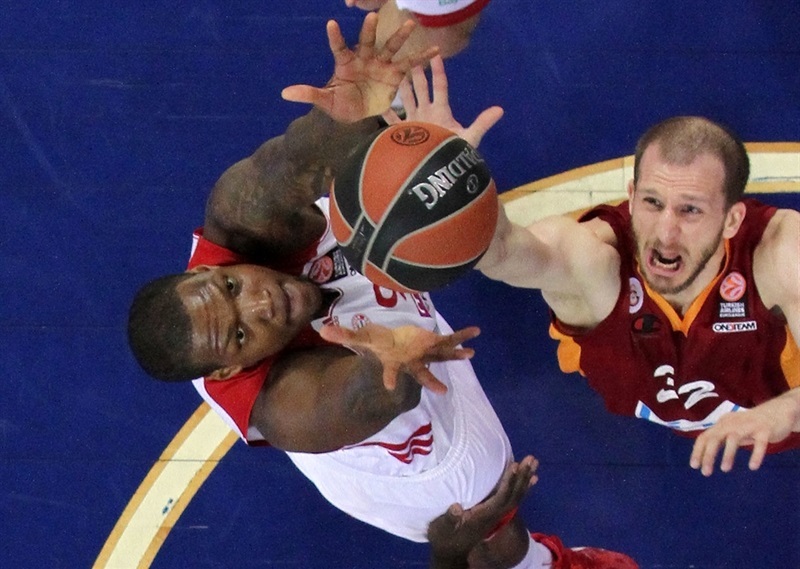 Full-court pressure forced a Galatasaray turnover that Munich could not make pay. Instead, Arroyo found Mensah-Bonsu again for an open alley-oop that felt like the game-winner at 73-66 with under a minute left. 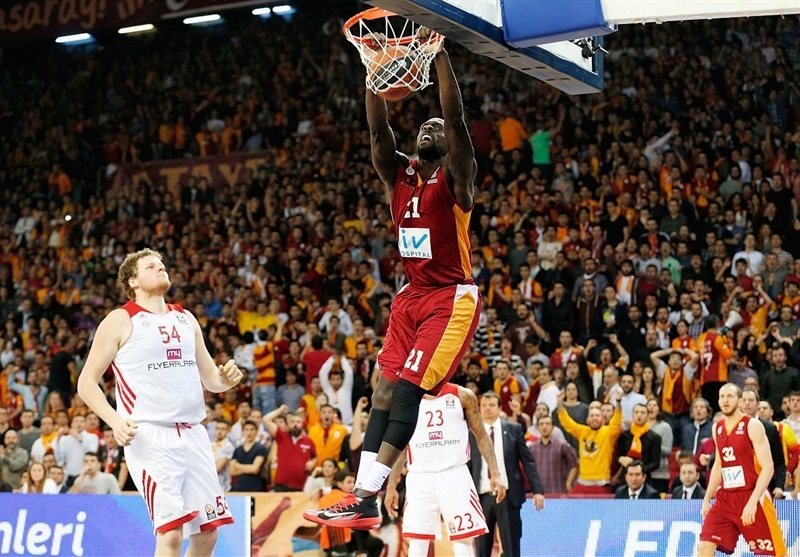 Mensah-Bonsu made sure with a blocked shot on Djedovic while Hairston rewarded the crowd with a triple from the corner as Galatasaray held onto a victory that could be worth its weight in gold before the end of the Top 16. "Obviously, it was an important game and both teams performed extraordinarily. Defensive toughness especially kept Bayern Munich in the game with Schaffartzik’s pressure on Arroyo. We usually used two guards together in the game in order to settle our offense. We played the pick-and-roll game well. Mensah-Bonsu rolled very well on offense. I think we missed couple of open perimeter shots. Arroyo and Ender shot 1-for-9 together, way below their normal percentages. In the end, I want to congratulate my team and the fans who supported us tonight." 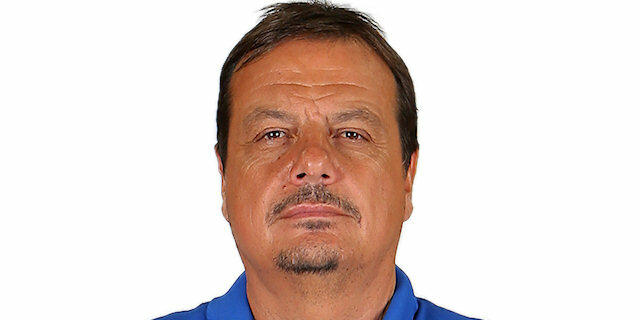 "First of all, I want to congratulate Galatasaray for the victory. 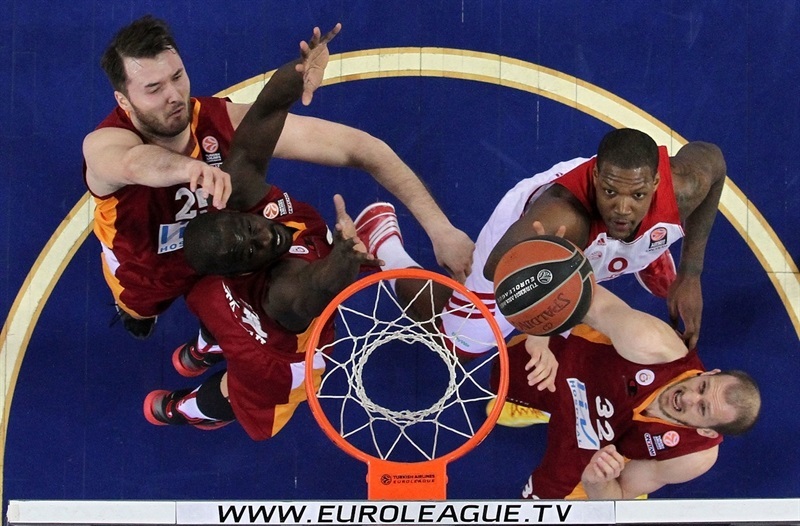 We defended well tonight, but also Galatasaray is really good on offense. It's impossible to stop all of the Galatasaray offenses. We fought for all possessions, but we couldn't control their offensive power. It was a close game. 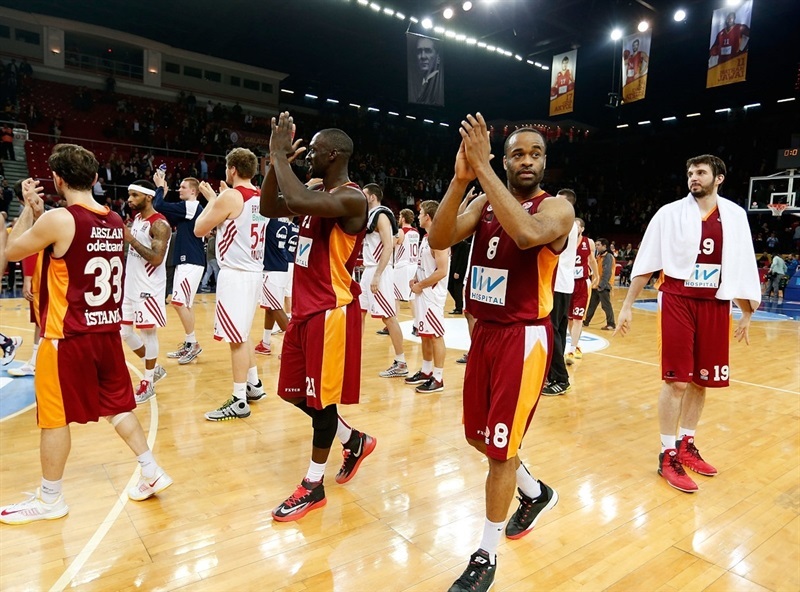 After the second quarter, Galatasaray led the game and won in the end." “It was a very important game to keep our chances alive for the playoffs. I think both teams did everything to win the game. Bayern Munich was trying to win the game, just like we were. But we did small things better than our opponent. We used our experience, especially in the last quarter, to stay strong and patient. We are very happy to win."